Update December 19, 2017: With five guilds having now downed Mythic Argus, the Unmaker, world first guild Method have released their kill video. No final secret phase awaited in the last 20% of Argus’ health bar, but there are some fairly odd strats on show, and some pretty hilarious moments. For the future of World of Warcraft, here’s the Battle for Azeroth release date and everything else. Here’s the full video, created by Method’s video producer PlebCentral. My two favourite moments are everyone telling somebody to shut up when they say this is going to be the kill – well at least they were right – and the total panic when the lack of a kill notification implies there’s going to be another stage of the fight at the end. You’ll notice at one point they all die, outside of the phase transition in the fight. This was apparently to dodge a mechanic that otherwise puts a damage over time effect on the entire raid for more than healers could easily keep up with. They then use the resurrection tree – itself meant to keep players alive through various bits of raid-wide damage by providing extra lives – while a Monk tank uses their unique abilities to survive Argus’ massive single-target damage for a few seconds. This wasn’t the first time the entire fight was publicly available, as Chinese guild Alpha, who were the world fourth kill yesterday, streamed their progression and eventual victory. Traditionally, the first kill video is released by the first guild to down the boss, nabbing them the viewer figures, ad revenue, and props. How that all changes going into Battle for Azeroth remains to be seen. Members of Method have stated that while there is competition for World First – and the likes of second place Exorsus, NA’s Limit, and the Chinese guilds are certainly providing it – they won’t be streaming their process. However, it’s likely the first raid of the new expansion will see a massive increase in interest from an expanded player base, as we saw at the start of Legion. Missing out on that viewership may, eventually, be too much to bare. Patch 7.3.5 is next up for WoW Legion, after which it’s expected we’ll see the Battle for Azeroth beta spin up on test servers, leading into launch later next year. Nothing official yet though, so delays could and probably will happen. Update, December 13:The final boss of World of Warcraft: Legion has fallen. After a race that took over a week to complete, Mythic Argus, the final boss of World of Warcraft’s Legion expansion, and the only one left standing, has been defeated. Method were the first team in the world to defeat the raid at the game’s hardest difficulty. The world first was confirmed by Sco, Method’s co-owner, who seemed pretty emotional about the team’s acheivement. The victory was corroborated on Method’s website, with a post reading “and we have a kill! METHOD TAKE WORLD FIRST ARGUS!” It took the team 40 minutes to kill Argus on their final try. On their penultimate attempt, the team had been wiped out leaving Argus on just 0.5% health. Ten of the raids 11 bosses were defeated on day one of the raid, and on Sco’s stream, which went live a few minutes ago, he says Method attempted the boss 320 times in the last week. 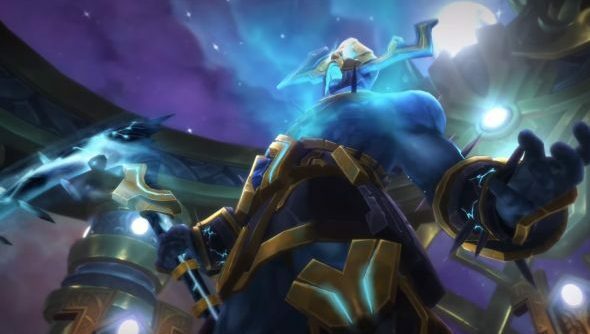 Update December 11, 2017:Despite worries this raid tier would be over very quickly, Mythic Argus, The Unmaker, the final boss of WoW: Legion’s final raid, is proving a tough nut to crack for the world’s best guilds. It’s been a solid four days of raiding and World of Warcraft’s current final boss is living up to his status. Despite eleven guilds now having unlocked the fight against Argus, none have managed to down him. We do at least have some footage of the fight now, as two Chinese guilds are streaming their attempts to bring him down. The transition itself is the same as what happens on Normal and Heroic difficulties, with the difference of Argus turning red. His abilities once the raid has resurrected are different, specifically the spinning scythes and expanding black circle on the ground, with a targetable center point. On other difficulties there is another phase between the first and the forced wipe, which has been removed from this version. Argus also heals to 60% during the transition on Mythic, which combined suggest there is yet another secret phase change that triggers once you knock off that healed HP. The only ones likely to know about that are Method, Exorsus or Limit, the guilds that have been fighting Argus the longest. Here’s one of the Chinese streams of the fight – their best attempt so far is 56.4% in Phase 3, so you understand how far there is still to go. If you can navigate Chinese streaming platform Douyu, there’s a few more folks streaming on there as well. Complicated stuff. If you’re wondering about the “mathematically impossible” line, along with Sco’s rather amused expression, it’s a long-running World of Warcraft meme – dating back to C’Thun raids in Classic more than 10 years ago – for any boss that people find particularly challenging. It was last invoked on Fallen Avatar, the second-last boss of the previous raid, Tomb of Sargeras. Method defeated that boss a few hours afterwards. It’s unlikely that anyone will get him down before the instance reset on Tuesday for US, Wednesday for EU, which gives the guilds another round of loot to empower their characters. That’s a significant power bump and it’s rare a trouble boss will survive that first reset. Update December 7, 2017:With 24 hours of raiding from EU guilds, every boss but Argus has been defeated in Antorus, the Burning Throne. Well, this one might not take too long. Once the EU guilds got access to World of Warcraft’s latest raid, and the final one for the Legion expansion, bosses started dropping very quickly. Method and Exorsus, the two favourites to take win the progress race as a whole, quickly cleared through the bosses that the US guilds had beaten overnight. They then got to work on Aggrammar, the second-last boss, and Method have already managed to take him down. Just one remains. This leaves things in a slightly precarious situation. Either Argus will go down relatively quickly, and Antorus will be seen as a little on the easy side, or he’ll prove a roadblock, and be seen as repeating the mistakes of Tomb of Sargeras’s legendarily difficult final two bosses. None of this has any bearing on how much the average player enjoys the instance, of course, but the progress race is seen by many as a metric of Blizzard’s success. The only people who know which of these it’s likely to be are Method themselves, who finally went to bed in the early hours GMT after around 20 hours of straight raiding. They’re the only guild currently fighting him – likely waking up to start getting their attempts in around about now – and the Argus fight on Mythic only bares a slight resemblance to other difficulty levels. The last half, or possibly more, of the fight has deliberately obfuscated mechanics to keep people guessing. Method’s site, Raider.io and WoWProgress are keeping a good track of the race, and your best bet to know the second Method beat it is guild leader Sco’s Twitter feed. It would be quite surprising if they don’t manage to kill Argus before the end of the weekend at the very latest, or if one of the other guild’s overtakes them now they’re a full boss ahead. If you’re interested in seeing videos of some of the previous bosses going down, Refute of top US guild Limit has kill videos on their YouTube channel. Various folks are also still streaming over on Twitch, though most of the more popular or further progressed streams won’t come up until later in the day. Method don’t stream their progress, at least during this expansion, so don’t expect to see Argus for a while. Original story December 5, 2017:The final raid of World of Warcraft’s extremely successful Legion expansion is now live, and the hardest difficulty unlocked today – tomorrow for EU. This means the Mythic Antorus, the Burning Throne progress race, the competition between the world’s best guilds to be the first to beat each boss and the raid as a whole, has begun. With the raid only available on the US realms, it’s expected that US-based guilds will get the first few bosses down, and several are already. Raider.io and Method.gg do a good job tracking everything, with the former being purely the data while Method will give you a lot more context and explanation. Expected to win the race is Method themselves, as the most dedicated guild in the world and the ones who won the last progress race for the Tomb of Sargeras raid. While there are other guilds who put serious time and effort into the game, Method are in a tier of their own at the end of the expansion. Unlike the start of the expansion, streaming Mythic progression is now very common. While writing this I have Big Dumb Guild’s Polywag, a Mage player, in the background. They’re currently in second place behind Limit. Check the World of Warcraft page for more streams from various folks. With five bosses down it’s edging up on being a pretty fast and easy race. However, the start of every raid always looks like it’s going to be disappointing until the guilds start running into road blocks, like Avatar of Sargeras or Kil’jaeden in the previous raid. After the overtuning – extreme difficulty, that is – of those encounters last time, it’s predicted that Antorus is meant to be a little easier. Either way, the secret phases of the last boss, Argus, will take quite a lot of work before anyone gets them down. We’ll update tomorrow with the progression of EU guilds and notes on which bosses are proving most difficult.